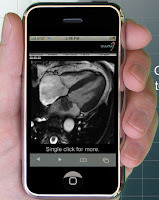 Heart Imaging Technologies (HeartIT) announced July 16, 2007 that WebPax images can viewed on an iPhone. WebPax is a DICOM compliant, scalable medical image management system developed by HeartIT. Mobile access to medical images can facilitate consultation with other medical professionals or be useful in discussion with patients. However, the small image size (due to the nature of a mobile device) limits the utility of these images. No free demo is available. High quality example videos of medical images on an iPhone can be found on the HeartIT site.